TOPIC: JD Magazine template - what is recommended photos size? I just bought this template, and I would like ask for recommended photos size. I know it could be automaticly rescaled, but eg. Facebook have their recmended size for eg. album photo, background photo. Eg this sandwich is 568x369 (but on front page it looks bigger? Or this is recommended size? If I switch off the right column, so the sandwich photo could be to the end (where are socila media and newsletter on the right now). What should be the size, as I want big photos for the galleries. Thank you for buying our the template. 1. Yes, 568x369 should be fine. 2. To fit an image all the way from left to right, make it 1110 X 721. What is recomended way to upload photos? I usually do this by ftp or go to media and click upload in recent folder. However, when testing your template I clicked (create new article) then [Blog Options] tag then [Upload Image] -> so I realized than I had automaticly 2 photos automaticly in 2019 folder 02 -> 09 subfolder, with 2 sizes original one and resized one. Is it possible to upload photos in such way, so I could have automaticly in date folder wit resized version as well? What is a difference between a photo added in [Blog Options] and [Images and Link]? Last Edit: 2 months 2 weeks ago by Polnewz. 1. The recommendation obviosuly would be to do it by date so you can easily track them. 2. But Joomla by core doesn't support it and this is only possible using Astroid Media Manager, that's available in the Template Options (When selecting image or videos or images for elements in the Template options). 3. 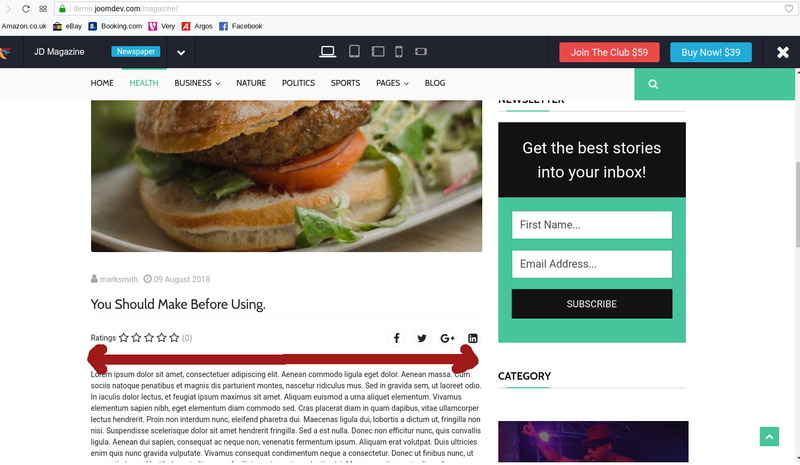 If you want to use the blogging features of Astroid then use the Blog Options (This is an Astroid feature and will not be useful if you don't use Astroid) for everythign else use Images and Link. To keep photos in the same manner, I say use FTP and manage manually or just hop into the Astroid Media manager whenver you want to upload files. Just don't select them but use it for uploading and it will take care of creating the folders and stuff . What is the size a photo to fit inside article (568px looks to narrow)? The same with both long banners - what size best? Those 728x90 on the top has 780x109, a bit lower has 638x91. 1. The width of the colum is 730 + 15px margin on both sites. So that's 760px in total. 2. Yes, The actual sizes are different and are what you mentioned. 3. I'd suggest go with standard banner sizes.